What is Trenchless Pipe Repair Using Burst Pipe Technology? Burst pipe technology involves hydraulically pulling of a large cone shape head by a steel cable underground to break apart and expand the old pipe and simultaneously pulling into place a new high-density polyethylene (HDPE) pipe of the same or larger size than the old pipe. The large cone shape head, also known as a bursting head or bullet breaks the existing pipe while pulling and laying the new pipe behind it. 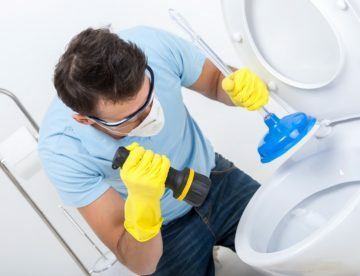 The first process involves the running a sewer camera through the drain to evaluate the problem and know the pipe to be repaired for best results. This step involves digging two small holes at either end of the pipe to be replaced. A cable is inserted at one end and fed through. An end of the cable is connected to a pneumatic jack and the other end is attached to the bursting head. The bursting head is connected to a new high-density polyethylene (HDPE) pipe. The bursting head breaks apart the old pipe and pulls behind it the new pipe as it is pulled through the old pipe. 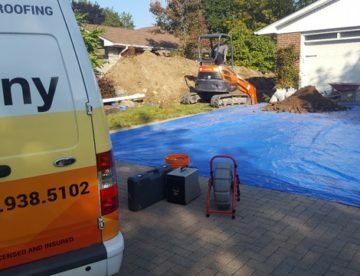 Trenchless pipe repair is done through small access points; so, there is no need to bring in excavation equipment and have piles of dirt in your yard. 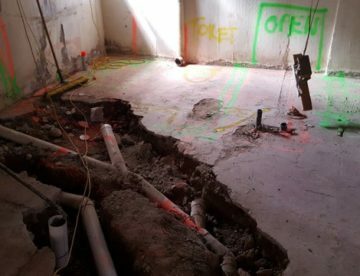 Excavation is both expensive and requires an additional expense for remediation of the dug site. Adding the cost of potential repairs to the walkway, driveway or landscaping to the expensive method could be an overwhelming cost. Burst pipe method replaces the damaged pipe entirely with a long lasting high-quality HDPE pipe, which can last for over 100 years. Burst pipe repair method causes less disturbance to you and your neighbors and can be completed as quickly as one day.